I wanted to send you off with one of my favorite recipes before I escape for the 4th of July! You can use any berries or mix ins that you love. Enjoy! Heat oven to 375, whisk together dry ingredients. With an electric mixer, cream butter and sugar for a few minutes. Add eggs and vanilla. Beat until well combined. Alternate mixing in dry ingredients and the yogurt until just combined. Gently mix in blueberries. 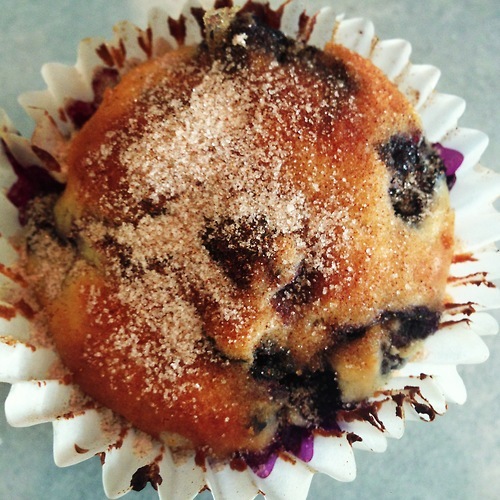 Place baking cups in muffin pan or use cooking spray. Fill with batter and bake for 20- 25 minutes. Cinnamon sugar topping- melt 2 Tbls unsalted butter. mix together ¼ cup sugar with 2 tsp cinnamon. Brush the top of muffins with butter and then roll in cinnamon sugar. Irresistible.